I grew up in a big salad-eating family. We ate a salad with every meal, and I loved it. Of course, it was iceberg lettuce, with shredded carrot and red cabbage on top, but I thought it was soooooo good. At my grandparent’s house I loved it because it was drenched in this dressing, which we called “Grandpa’s French.” I never knew where he got the recipe, or if he came up with it himself, and I had no idea what was in it other than oil, vinegar, paprika and a clove of garlic. So I was never able to recreate it. For years we ate salads with just plain oil and vinegar, or with Newman’s Italian (for a store-bought dressing, it’s pretty good). Then, right after I had Desmond, my Aunt Judy and mom somehow found this recipe in my vintage Betty Crocker cookbook. If I remember this correctly (I was in the “new mom haze’), we all agreed that it sounded just like Grandpa’s French! So we made it. Lo and behold, it tasted like Grandpa’s French! Could it be? He got the recipe from a cookbook?? I always imagined that it was some culinary genius that he came up with on his own. But of course, it’s from Betty Crocker. That was my grandma’s cookbook. She was a “Betty Crocker” loyalist (vs. my Granny, who was in the “Better Homes and Gardens” camp). I’ve been making this dressing for us ever since. We haven’t bought dressing in YEARS…once you know the formula for a good vinaigrette, there’s really no point in buying dressing. It’s 3 parts oil to 1 part vinegar (or citrus juice, like lemon or lime), and spices. Every once in awhile, I’ll make some other kind, but for the most part, we always have this in the cabinet (and yes, we keep it in the cabinet and not the fridge, just like my grandparents did). 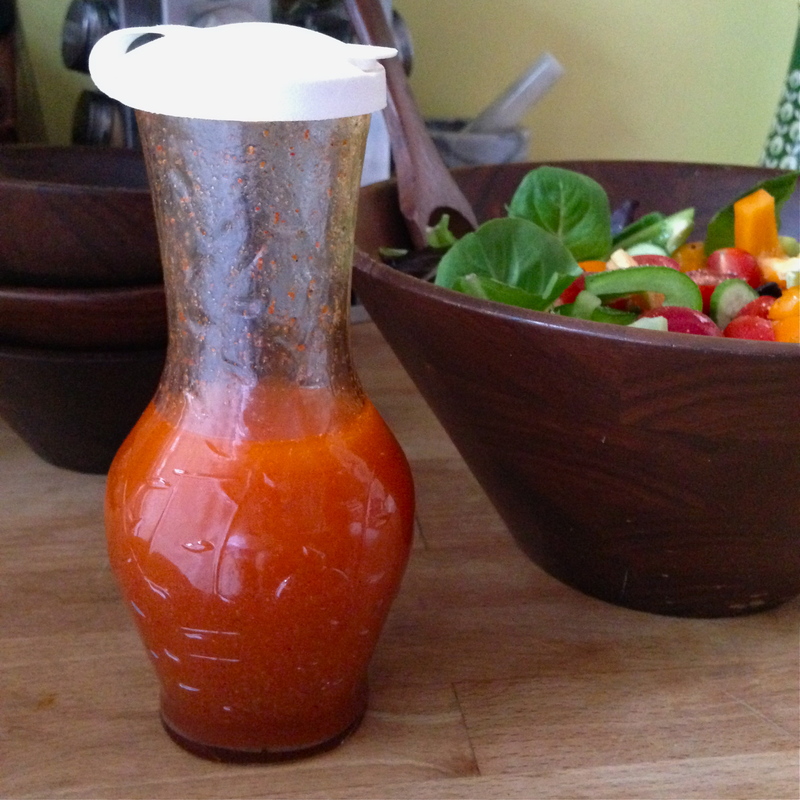 This dressing is always a hit with everyone that tries it…I’m constantly getting asked for the recipe. So I thought I should probably post it. I wish I had a photo of my son drinking it out of the bowl after he finishes his salad…he likes it THAT MUCH. 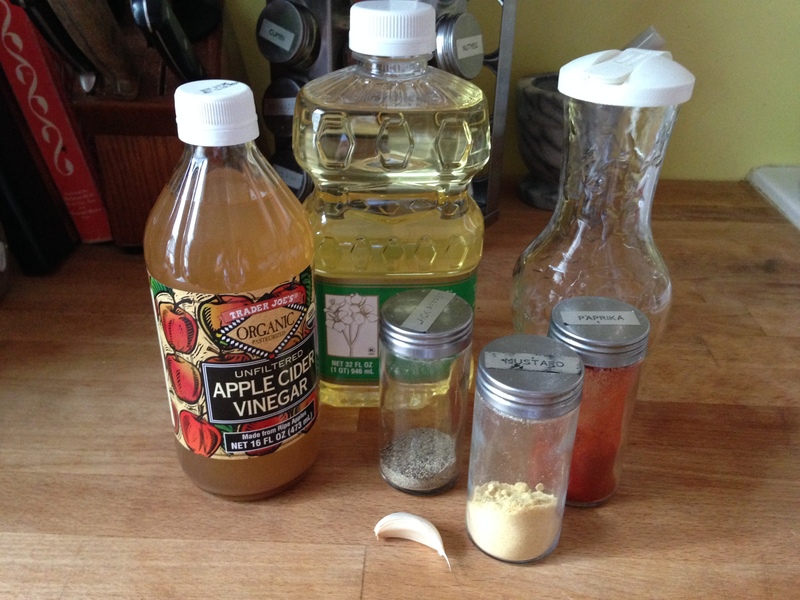 Place all ingredients in a jar or dressing bottle, place lid on it and shake until completely combined. It’s best to make it at least a few hours before using, even better the day before, so the flavors have a chance to infuse.